I’m pleased to announce a new publication to come out of the lab, with lead author Dorothy Maguire and co-authored by Elena Bennett and Patrick James. In this work, Dorothy ponders and writes about the broader implications of insect herbivory. More specifically, how insect herbivory is affected by landscape connectivity (i.e., the degree to which habitats are linked to each other), and how plant-feeding insects may relate to ecosystem services (i.e., the values and services that humans get from our natural systems). 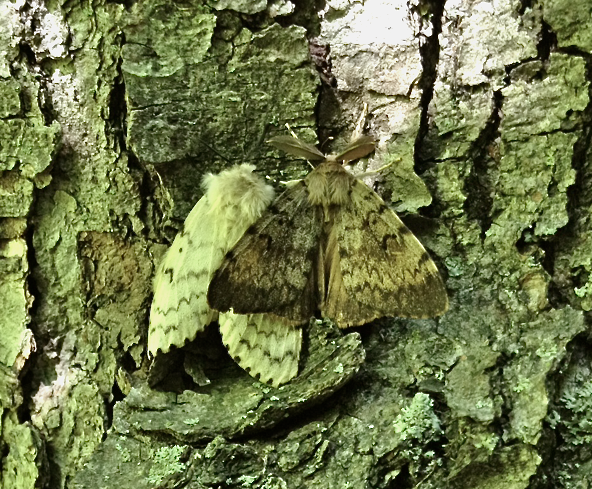 Important insects when, as caterpillars, eat a lot of foliate: Female (l) and male (r) Gypsy moth, caught in the act. We certainly know that insects can do all kinds of damage to plants in ecosystems, but do insects in more (or less) connected habitats do more damage? To address this question Dorothy scoured the literature and got the relatively unsatisfactory answer of “sometimes”: 49% of the papers suggest increased connectivity relates to more insect herbivory and 28% of the papers show less herbivory in more connected patches. The lack of a clear answer actually makes quite a bit of sense since every context can be quite different, and not all insects are equal. It is hard to generalize since effects in forests will not be the same as in fields, and insects that are out-breaking (i.e., with major population explosions) may be affected differently than non out-breaking species. Dorothy certainly found these contexts were important. The results were important to illustrate how we need to adapt any management options with close attention to both landscape feature and their interaction with the life-history of the herbivore. The second part of Dorothy’s work delved deeper into the literature to ask about the effects of out-breaking versus non out-breaking herbivore species on a select suite of forest ecosystem services: effects on timber production, aesthetics, soil formation and Carbon sequestration. There were some interesting results of this and again, any particular effect of herbivory on an ecosystem service was highly sensitive to the outbreak status of the herbivore. For example, the aesthetics of a forest can be positively affected by low levels of herbivory since this may help create pleasant conditions for light infiltration to the forest floor. However, an out-breaking species may defoliate a tree more completely, thus reducing the aesthetic value. Another example is that low levels of herbivory may positively affect timber production because trees may show “compensatory” growth after light feeding by an insect. In contrast, timber production will be negatively affected by high levels of defoliation as this may reduce a tree’s ability to grow. Although some of these results may seem rather logical, Dorothy’s work was unique as it showed how the scientific literature supports the connections between a herbivore’s life-history and key ecosystem services. Visual representations of the hypothesized relationships between insect herbivory and ecosystem services. Specifically (a) timber production, (b) aesthetic value of forests. Graphs are divided into four sections representing positive and negative effects of herbivory on ES, during non-outbreak (low) vs. outbreak (high) levels of herbivory. Quadrants are coloured differently based on the hypothesized strength of the effect of herbivory on ES: weak (light grey), moderate (dark grey) and strong (black). Proposed relationships are derived from synthesis of the available literature. From Maguire et al. The last part of the work was focused on building a conceptual framework – a framework that ties together landscape structure, the process of herbivory, and ecosystem services. This is meant to be a road map for any stakeholders with an interest in any or all of those factors. For example, should a forest manager be tasked with understanding how to increase or support a particular ecosystem service, she or he needs also to recognize how that service is tied to important processes such as herbivory, and the related connections to the broader landscape. This work is novel and important because it links the well known process of insect herbivory to concepts of ecosystem services and to the discipline of landscape ecology. The marrying of these areas is critically important as we face increasing pressures on our natural systems, and the complexity of the systems can be overwhelming. We hope this work piques more interest in this topic, and that the framework Dorothy provides is useful to all the stakeholders.